I am sitting here on my porch, listening to and watching birds. It’s what I would call a perfect May day, although we could use some rain. The sky is robin egg blue, the temperature is hovering around 70 degrees, and a gentle breeze is keeping the black flies at bay. The air, itself is infused with the song of birds. Lately I have been marveling at the capacity of the song bird to produce such a full-bodied, melodious sound. Did you know that the voice of the song bird enables plants to achieve more optimum growth and produce more food? One only has to sit outside on a spring day to believe that this can only be true. There is something truly magical and peaceful about the song of birds. The purpose of this post, though, is not to extol the lyrical gifts of the class of birds we call “song birds,” but also to explore their gifts as messengers from the spirit world. As I have written in previous posts, when we pay attention, spirit often speaks to us through nature. Today, while I took the dogs for their early-morning walk, a male cardinal flew across my path and stopped in a hemlock on the side of the road, waiting to be noticed. Yesterday, while I drove my daughter to a sporting event, first a male, and then a female cardinal flew in front of the windshield, bisecting my path in a dangerously close encounter that I could not fail to notice. When we encounter animals and birds in such a manner, it behooves us pay attention, as spirit is trying hard to get a message across to us. Cardinal was certainly trying to tell me something, so this morning I took careful note. First, I took inventory of my thoughts – the ones that were passing through my head at the moment the male cardinal decided to fly across my path. I had, I quickly realized, been thinking, or rather, fretting over my desire to manifest more clients and grow my healing business – a subject that has been consuming me of late. As my daughter told me the other day, “Well, you told the universe you didn’t want a lot of clients before you have the space for them.” Yes, she was right, and I have been trying to “correct” that intent over the past several weeks, as I realize I am ready, and able to handle more clients while I wait for my new healing space to be created. So, those were my thoughts when the cardinal passed over, which led me to my dreams. Last night, while I slept, I was telling a woman I had met, who was in emotional distress, that I could help her, but as I searched through my wallet for my business cards I realized they were missing. The previous night, I dreamed of sitting at the top of a very tall and long slide. It was red, rimmed in orange (symbolic of the first and second chakras, where we house our grounding energies, basic needs, and also our creative energies). The slide was steep, and had at least one “bump.” In the dream I was holding onto the hand rails at the side, very reluctant and fearful of descending. A woman at the bottom was urging me to let go and slide to my destination. The first chakra, I might also note, houses a lot of our most primal, deeply rooted fears, and the second chakra is also our sexual chakra. The slide, I realized the next morning, was like a birth canal, and I was being asked to let go and “rebirth” a new, fearless self. Back to the cardinals I encountered of late. 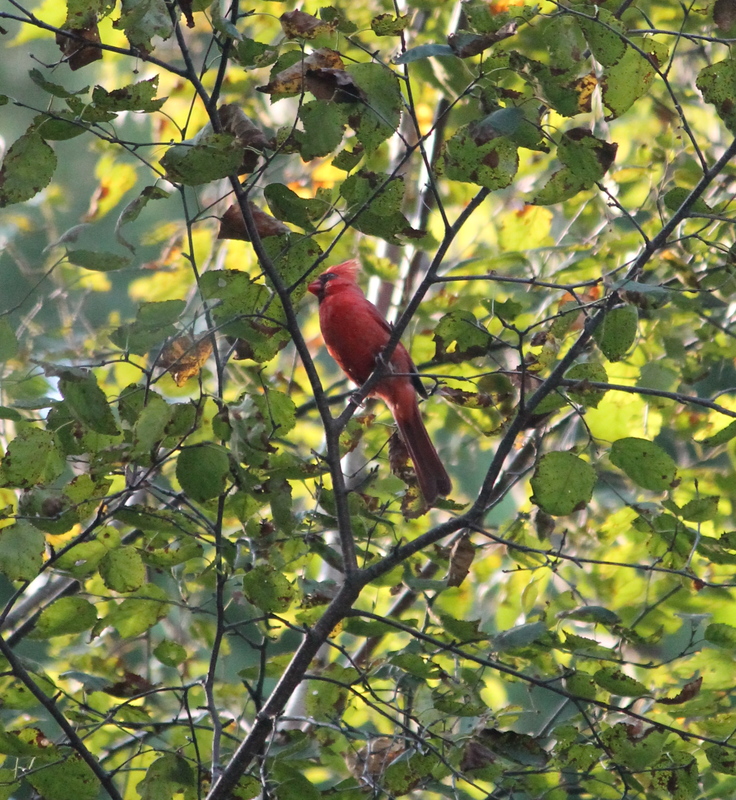 Today, when the male cardinal flew into the hemlock, I stopped briefly to ask its message for me. Do try this for yourself, if you don’t already, you’ll likely get a response inside your mind. The words that entered my own mind spoke of insecurities and self-confidence, they spoke of the symbolism of the colors red and orange, and of that beautiful, fearless, full-bodied song housed inside that small bird. Being a natural “doubter,” I like to check my sources. So, I went home and read though the section on cardinals in Ted Andrew’s book Animal Speak, my personal, go-to guide for animal symbolism. And there it was, right at the top of the page, “Renewed Vitality though Recognizing Self-Importance.” In other-words, don’t give up on your dreams and keep walking your path, leaving fear behind. As Andrews also notes, cardinals with their loud, clear song, urge us to listen and heed the messages around us, while their colors remind us to breath new life into our ambitions, and assert our creative selves. So, pay attention to the birds who cross your path, drink in the healing energy of their songs, and ask them what messages they hold for you. This entry was posted in Animal Messengers, Dreams, Reflections and tagged base chakra, bird symbolism, cardinal symbolism, color symbolism, creativity, fears, first chakra, sacral chakra, second chakra, song birds. Bookmark the permalink. Hello Alethea! Wisdom from your daughter for sure. I love Ted’s book too. I think it is a great idea to trust the information that comes when animals come suddenly into your life during the normal course of the day. Every day is a day to learn more – messages come from all around us. I love this post, and I adhere strongly to the messages that our feathered friends bring. My journal is full of wonderful insights and guidance they have brought, and you are right about us heeding their messages; they often have so much to give us besides their lovely songs. Wonderful to hear from a fellow “listener.” I too keep a journal of encounters, when I take the time to jot them down. Thank you for reading! This was a great message for me to read. I’m in the process of pursuing my dream to be a novelist. I’ve also toyed with the idea of starting my own website/blog just to get things out of my head, and to write, which I love to do. I had been having slight doubts as far as both go. I am making great progress with my first novel, and have a great deal of optimism, but slight confidence issues being that this will be my first book. I’ve been having more doubts when it comes to my website, and just my position in life/ambitions, etc. I am still sitting on my mother’s porch where a few minutes ago a Cardinal flew directly towards me over my head. It was accompanied by another, maybe two, but they changed directions. The one flew directly at me. There is a window directly behind me. The back of my chair is about 2 inches away from it. I was too startled to look up to see what the bird was doing, but it never hit the window. I look out into the yard again, and a few seconds later it flew back out in front of me as if it had hovered over my head for a few seconds. I never heard it touch the window. The whole occurrence stood out to me. Everything I have read so far on this and a couple other sites speaks directly to me, and the stage I am in right now. Thank you for sharing. I have a new found drive and confidence!